Exlaim! Review of "The Motherland"
Top Canadian Singles Review of "The Motherland"
Exclaim! reviews "In the Rock Hall"
Dave Bidini, singer/songwriter, author, columnist, and all-around national treasure, has been making music for over 30 years. Having established his reputation as a founding member of the Rheostatics, with BidiniBand -- where he is joined by drummer Don Kerr, guitarist Paul Linklater and bassist Doug Friesen -- Bidini has continued to develop his inventive, challenging, literate, and distinctly Canadian voice. 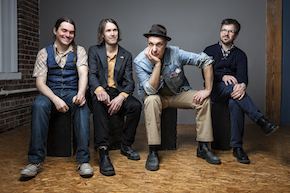 The Motherland, the third BidiniBand album, is another milestone in Bidini's extensive catalogue of artistic achievements. It's a bold, 10-song collection that musically runs the gamut from prog to country rock, while lyrically taking pointed jabs at the state of the nation while under the Harper regime. The Motherland was laid to tape during an intense six-day stretch at Toronto's Revolution Recording with co-producer Joe Dunphy. Michael-Philip Wojewodamixed the album with the usual flair he's added to the lengthy list of projects he and Bidini have collaborated on. Call The Motherland Bidini's White Album or Quadrophenia, or call it simply a record that distills nearly a lifetime of playing every corner of the nation into a message of hope for all who still believe in rock and roll. This is the album that Canada needs right now. 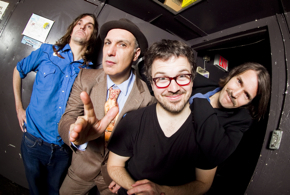 Dave Bidini is likely best known as one of the founding members of the Rheostatics. Since the bands separation in 2007 he is now known as the only Canadian to be nominated for a Juno, Gemini, and Genie Award, as well as the country's national book contest, Canada Reads, for his legendary "On A Cold Road." BidiniBand have released three albums on Pheromone Recordings, "The Land is Wild" (2009) and "In the Rock Hall." (2012) and the just released (May 2014) "Motherland." "In the Rock Hall" and was recorded in six days at Revolution Recording on Laing Street in Toronto by engineer Joe Dunphy. It's the first rock album made at the city's new state of the art studio. The album was expertly produced by drummer Don Kerr (Ron Sexsmith) and mixed by Michael Phillip-Wojewoda and features Paul Linklater of the Pinecones on guitar and Doug Friesen (John K Samson, Peter Elkas) on bass. The title track was based on the poem "In the Rock Hall" by author Paul Quarrington, and another track, "Eunoia," draws its lyrics from the epic literary work of the same name by Christian Bok. Otherwise, the band's Big Rock sounds touch on themes familiar to fans of Bidniband: pirates, war, dating, boating, Smurfs, the 80s, and movie-making. The music on "In the Rock Hall" was borne out of two years gigging in small clubs across the country, and many of the songs were moulded after live experiments with songs road-tested before they were studio-ready. Mastered by world-renowned Joao Carvalho, "In the Rock Hall" is an expressive, white-hot rock and roll statement from one of Canada's longstanding musical and literary pioneers and counts among his finest work in an artistic life that has already spanned four decades. The album "The Land is Wild" possesses "more songs about dead hockey players, cannibalism and lesbian school teachers." Members of the BidiniBand include former Rheostatic Don Kerr on drums and guitar& guitarist Paul Linklater; and Doug Friesen on bass. Don also produced the record.